The public stadium in Nowy Dwór Mazowiecki was opened in 1934, but only after WWII was relocated to its current location. Upgraded with landfill stands in 1960s, it later received its speaker’s tower in 1974. Since 2004 it’s equipped with floodlights, erected upon local team Świt’s debut in the Ekstraklasa. But as the team only managed to stay one season in Poland’s top tier and later quickly descended downwards, it’s yet to see another major upgrade. Last relevant change was a floodlit training pitch with synthetic turf added in 2009. The ground is located in western part of Tomaszów Lubelski and is part of the town’s public sports complex. 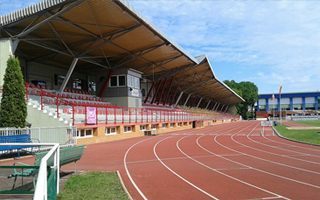 The field is surrounded with a running track and has two stands. Unusually, the main grandstand is located in the east and offer 300 covered seats and 350 standing places (including those for away following). Much larger western grandstand was added in 2011 and accommodates 1,400 people on an all-seated and covered section. Nicknamed Zwierzyniec due to its location in the district bearing this name, this athletic ground along 11 Listopada Street was planned in 1924, when the street was first laid. Opened in 1926, it received its first wooden stand a year later. In 1934 a brand new stand for 600 people was erected, followed by skydiving tower in 1935, later destroyed by the Nazis, rebuilt in 1950s and again dismantled in 1960s. Following WWII the stadium was Białystok’s main sporting arena, hosting games of a wide range of sports clubs, primarily football. That dominant role began to fade in 1960s, when largest teams started relocating to other parts of the city, leaving Zwierzyniec for athletics, training and secondary matches. Current state of the stadium is the result of 1998 reconstruction, when a 750-seat new stand was opened, later renovated in 2011.